Reading a book is like taking a journey … you never know where it’s going to take you! Delve in, and let the adventure begin! No passport needed to visit this Holy Land–it’s right here in New Mexico. Long called the “Holy Land of America,” this is land is like no other: inexplicable miracles, a weeping statue, prophecies and revelations, and rock formations that resembles scenes right out of the Bible. But holy doesn’t mean stuffy! Legends never are! north and makes two loops: one through the Sangre de Cristo (Blood of Christ) Mountains, the other into Red Rock Country. 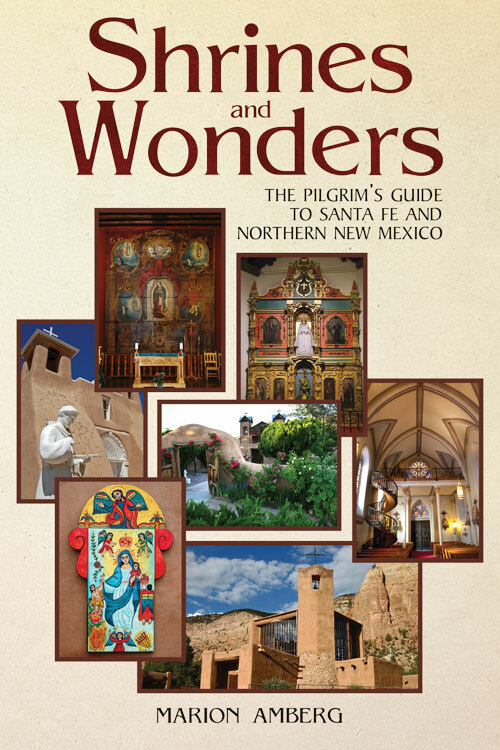 You’ll visit more than 25 holy sites (illustrated by 75 photos), including historic El Santuario de Chimayo, known as the Lourdes of America, and the stunningly beautiful Monastery of Christ in the Desert. May you sense the divine as you travel this hallowed land and follow in the footsteps of many holy people–even a canonized saint. Who is it? Join the pilgrimage and find out! The author: Personalized/signed copies. Check payments accepted. For discount information, use the Contact form above. Penny Prayers: True Stories of Change is a collection of stories about how the humble penny and the words “In God We Trust” transformed lives. You’ll hear “cent-sational” testimonies from a folk artist, a cancer survivor, and even a nun. So pray your pennies. It not only makes “cents”–it’s right on the money! Join the penny prayer movement … order your copy today!